As I drank some coffee, my heart sank reading in Tullian’s own words the grief, struggles, and pain that he had faced. Then, in typical Tullian style my heart was lifted to new heights as he opened God’s Word and unpacked the good news of the gospel. At the same time, each chapter left me prayerfully searching my own heart as I was firmly pointed away from my own idols to the only true hope that is found in Jesus Christ. Since that time I’ve been patiently waiting to share this book with you, and now I can. Thanks to my friends at Crossway Books, I have five copies of this book to give away to subscribers of the blog. I’ve also been given permission to publish five excerpts that stood out to me as I read it. 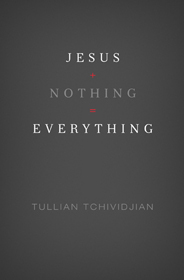 So each day next week (Mon – Fri) I’ll be posting one excerpt and giving away one copy of Tullian Tchividjian’s, “Jesus + Nothing = Everything.” That’s five excerpts, and five copies of the book over the week! As the giveaway is only for subscribers of the blog, if you’ve never claimed your free subscription today is the day to do so. You can subscribe for free via RSS or you can enter your email address and click the “Claim FREE Subscription!” button. Below is the trailer for “Jesus + Nothing = Everything.” If you’re reading via RSS or email, you may need to click here to watch it. See you all next week, and thanks for all your support in reading, commenting, and sharing.